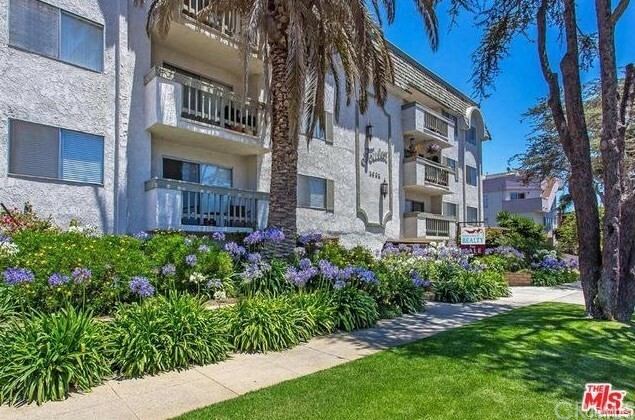 Located in the heart of Santa Monica, this ultra chic top-floor condominium features an open floor plan, one common wall, wood floors, walls of windows, and skylights throughout. Generously sized bedrooms with en-suite baths, luxury designer finishes such as mosaic tile, opaque glass counters, walk-in shower, and deep soaking tubs. Gourmet kitchen with a vented range hood, stainless steel appliances, breakfast bar, and dining area. Enjoy spending your summer days on the expansive rooftop patio with 360-degree views where a fantastic coastal breeze and custom bar with wine cooler awaits you. Just seconds from all that Montana Ave offers, award-winning schools, and the beach, the location of 947 18th st will be the envy of all. Stackable w/d, two parking spots and additional storage, with low HOAs that include maintenance, gardening & earthquake insurance. Franklin Elementary!! Based on information from California Regional Multiple Listing Service, Inc. as of 11/27/2018 8:26:13 AM PST and /or other sources. All data, including all measurements and calculations of area, is obtained from various sources and has not been, and will not be, verified by broker or MLS. All information should be independently reviewed and verified for accuracy. Properties may or may not be listed by the office/agent presenting the information.